Introduced in 2006 for the MacBook Pro, the MagSafe power connector is an Apple-first and Apple-only technology that uses an array of tiny magnets to hold the power cord in place and prevent your Apple product from being pulled off tables or desks. Newer versions of the product feature a different size MagSafe connector, meaning all your old charging devices (and let’s face it, we’ve all lost and bought new charging devices along the way) are now obsolete. Until, of course, an adaptor debuted. The adaptors, smaller than the power cords, are as guaranteed to be lost when traveling as those pesky power cords and other chargers. 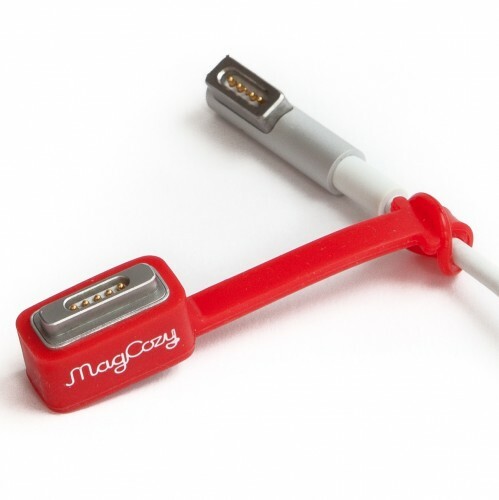 Thankfully, the MagCozy by Cozy Industries acts as a leash for MagSafe to MagSafe 2 converters. The simple design keeps the converters attached to power adaptor cords, key rings and Apple Cinema Displays. The product fits both T-style and L-style Apple power adaptors, and are available in clear, black, green, orange, pink, white, dark blue and glow in the dark. You can easily attach and detach the adaptor at any time, but it remains secured to the cable to avoid misplacement. A pack of two is available for $9.99.